Israeli Prime Minister Ariel Sharon said Thursday that his government had decided to establish "buffer zones" to protect Israelis from Palestinian attackers and would continue to work to prevent "total war." "We decided to establish buffer zones in order to achieve a separation," he said in a televised address. "We decided to start immediately and put in obstacles." Sharon did not elaborate but some far-right ministers have demanded special security zones bordering Palestinian areas in the West Bank and Gaza Strip. Sharon also demanded "complete disarmament" of Palestinians and reiterated his condition that there be an end to Palestinian violence and attacks before negotiations can resume. Sharon spoke after Israel carried out a wave of reprisal raids on Palestinian security targets across the West Bank and Gaza Strip, killing eight Palestinians and hitting Palestinian leader Yasser Arafat's headquarters. Read the complete text of Prime Minister Ariel Sharon's televised address to his people. Meanwhile, the Palestinian Authority took two steps towards defusing tensions, CBS News Correspondent David Hawkins reports. It arrested three suspects in the assassination of an Israeli minister last October, and Arafat called again for militants to cease fire. 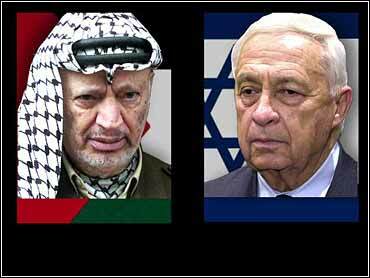 Sharon did not mention Arafat in his speech, but he said he would continue meeting Palestinian leaders. Sharon appealed to his people for patience and unity and said he would "make every effort to avoid escalation and deterioration into an all-out war." Responding to Sharon's remarks, Palestinian Cabinet minister Nabil Shaath said the Israeli premier offered "no hope" of ending the fighting. "This speech offered no hope, no complete suggestions, and opened no way to ending the confrontation and heading back to the peace table," he told CNN. "If separation is intended to stop suicidal missions, it has failed," Shaath said. "If it's intended to stop trade and communication between the two people, it has succeeded to the misery of both." The second successive day of fierce bombardments responded to Tuesday's killing of six Israeli soldiers in a Palestinian ambush. This week has seen the heaviest sustained violence yet in a nearly 17-month-old uprising against Israeli occupation. The fighting –in which 38 Palestinians, including two suicide bombers, and 10 Israelis have been killed since Monday – has left international peace efforts in tatters and prompted talk of all-out war. Despite that, Arafat repeated his Dec. 16 call for Palestinians to cease fire, and Israeli Foreign Minister Shimon Peres said during a visit to Spain that he saw no alternative to a negotiated solution. "We reiterate before all of you one more time the initiative that I launched on December 16 to make the cease-fire hold, and also to pursue the peace process," Arafat told a news conference in Ramallah. Shortly after Arafat spoke, Israel broke an afternoon lull in its attacks when helicopters fired missiles at security compounds in Gaza City and the southern Gaza Strip. Also Thursday, Arafat's security forces announced that they had arrested three suspects in the October assassination of Israeli Tourism Minister Rehavam Zeevi. Israel has said it would only allow Arafat to leave Ramallah, to which he has been confined since December, if he arrests and Zeevi's killers. Sharon's adviser, Raanan Gissin, said Arafat would only be able to leave Ramallah if he put the suspects on trial. In shooting incidents Thursday, a Palestinian man was killed by Israeli fire as he tried to cross an Israeli army checkpoint in the West Bank, between Jerusalem and Ramallah. The man's brother said the victim was shot in the back of the head, without provocation. The army had no immediate comment. At another Israeli checkpoint, in the West Bank village of Baka al-Sharkiyeh, a Palestinian gunman opened fire on soldiers at an army checkpoint, the army said. Troops returned fire, killing the gunman and another man, an Israeli Arab citizen, who had driven the assailant to the checkpoint, security sources said. It was not immediately clear whether he was an accomplice or had been duped by the attacker.